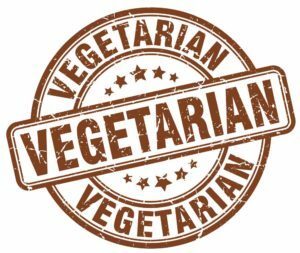 Vegetarians do not eat meat or poultry, fish or seafood, animal rennet or gelatin, stock or fat from animals, and insects. Within vegetarianism you are still able to consume dairy products such as whole milk, a grilled cheese toasted with butter, and for some, eggs. Egg and dairy consumption is known as lacto-ovo-vegetarianism, it is the most common. There are lacto-vegetarians who do not eat eggs but consume dairy, and ovo-vegetarians who consume eggs but not dairy. No eggs, dairy, or animal by-product is veganism. 🌿Eggs and bread are great staples for veg-heads. As a full time undergraduate student I worked two part time jobs that required three to four public buses one way to get to work my junior year. At this time I was also practicing a vegetarian diet for the first time. There was a financial ease knowing I could buy a carton of eggs for under $3 that could cover breakfast and lunch for multiple days. Eggs are a solid staple for many vegetarians for this very reason and they provide an excellent source of B12 and solid protein with up to 7g of protein per egg. Vitamin B12 is essential in the production of red blood cells, but you do not have to eat meats to obtain it. A lot of veggie burgers also use eggs as a binder, this means there are a few more options than if one is vegan or a lacto-vegetarian. Unless purchased directly from a small farm, the eggs you eat are unfertilized with no embryo and cannot become become baby chicks. 🌿Ezekiel Bread is pricey, there are alternatives that are much more affordable. Going for other multigrain, whole wheat, or sprouted breads will still provide high iron and fiber. Bread is very filling, and before you realize it you’re spreading almond butter and bananas on it. Toasted, with hummus and tomatoes, black pepper or hot sauce. It’ll be there at 3am when you awake from a deep slumber and need to munch real quick with a glass of water under the refrigerator light. 🌿I also like to add milk and cereal as perfect any time meals, making it a staple for me. Whole grain cereals aren’t as hard to come by anymore and there are also other options aside from whole grain. Many childhood favorites are switching to whole grain cereals as well, while still remaining tasty (and sweet)! General Mills cereals such as Cascadian Farms and my favorite, Cinnamon Toast Crunch, are easy to find. Alternative milks are a bit pricier at times, especially considering they don’t come in gallon sizes, however there are more options than before and it’s fun to play around with if you desire! (Huge fan of rice and oat over here). Grains and Beans, Vegs Get proteins! 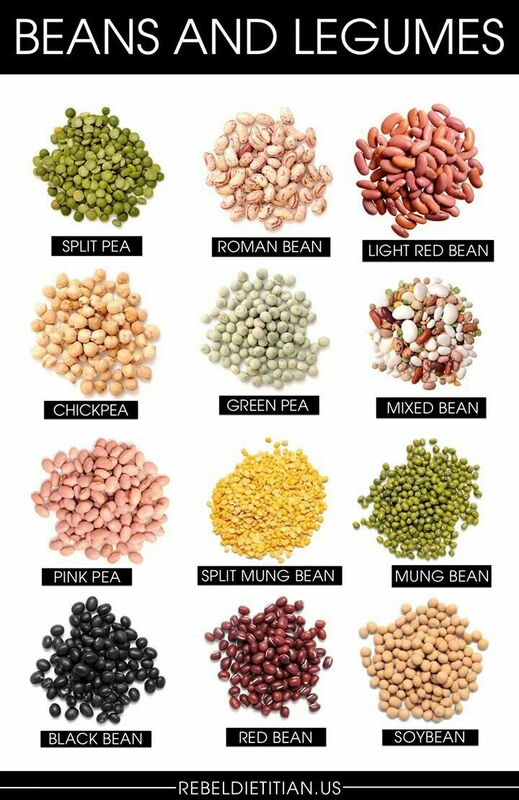 Absolute go-tos are legumes and grains, their versatility stretch across cuisines with simple changes. 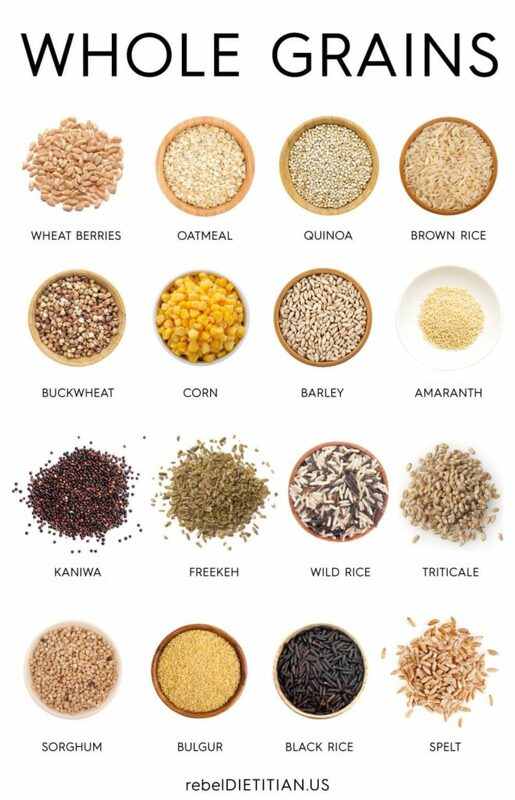 Black beans, chickpeas, lentils (green and brown are easier to cook than red), oats, rice, barley, and quinoa are a few. These are excellent alternatives to meat and are huge sources of various nourishment. Protein is the biggest “but what about” for veg-heads, these knock out that misconception. Foods like these are high in iron, can help reduce blood sugar, and are great sources of fiber as well. Their substitutions and inevitable inclusion into a meatless diet yield benefits two-fold. Personally, I like to always have green lentils, black beans, basmati rice, quinoa, and steel rolled oats on hand. Even if I’m not eating them frequently for a season, they’re always there. There, when I open the cupboard hungry, with $2.36 to my name, ready to be thrown in the pot. Now that we know the staples to go after, we need to know “how” to shop. When shopping, be mindful of merchandising. For every product you see labeled organic or specially branded (you know the type), within eye’s view there is always a conventional alternative, organic store brand alternative, or bulk alternative. Just because the flashier spirulina sprouted organic popcorn is right there next to the cutely packaged quinoa puffs on peak shelving, it isn’t the only option. Every store also has their own private brand: Whole Foods Market has their 365 Brand, Target has a few including Archer Farms, Simply Balanced, and Market Pantry. With these you find that you can save sometimes in the dollar amounts. 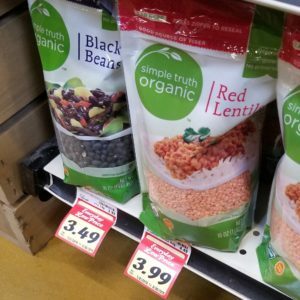 I saved over a dollar buying one pound of packaged organic green lentils from Whole Foods 365 brand versus a well packaged bigger label where you could chase the organic integrity back to the farm. Although a neat tool, do I really care enough to pay more? Opting for conventional as opposed to organic will help save money if you have no preference. Buying local whether from your nearest farmer’s market if accessible to you, or searching for local tags in your store is always great too! Local products are generally produced organically and are sustainable with great prices. Buying in bulk can sometimes even further these deals. 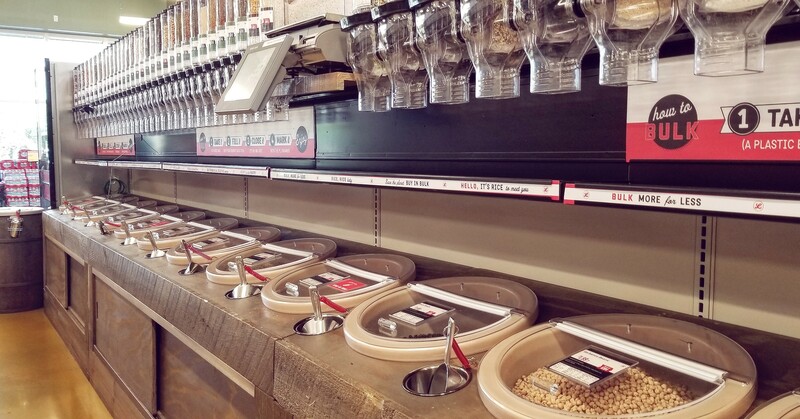 Stores such as Lucky’s invest heavily in their bulk section and have prices that can cut costs by over 50% from packaged items sometimes. Costs totaling as little as $1.49 a pound for tri-colored quinoa which could cost upwards $4.99 packaged for the same amount. (Keep in mind, store prices will vary from location to location.) Buying in bulk also helps decrease waste with less packaging, using reusable bags and jars are options at many stores. Just ask! If they don’t already have certain tares in the system you can usually ask to have your home container weighed prior to receive your tare weight for when you check out later. Although not an exact comparison due to nonavailability, you can see how much more money is saved buying in bulk. 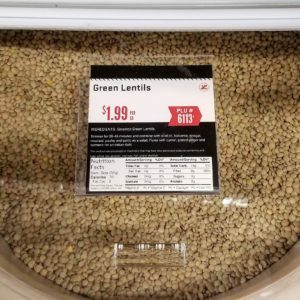 On average, a pound of conventional bagged green lentils is also about $3-$4 depending on the store. This also goes for canned foods, while $0.79 for a can a beans is cheaper than a bag, buying in bulk still saves more money because a pound in bulk is only maybe $0.50 more for the few ounces. In the beginning, seasonings can seem like a huge investment when you’re just starting to play around with food. Seasonings however are massive in setting textural distinctions for your taste buds — basmati rice could have sesame seed oil and soy sauce with green onions for lunch on Monday but, dinner on Wednesday could be the rest of the pot of basmati rice mixed with a curry and coconut milk. Salt and pepper are definitely required in any solid kitchen. Even if you’re not into spicy food, it doesn’t mean you have to omit spices; cayenne or crushed red pepper, garlic powder, an off brand creole seasoning, or dried oregano leaf can go a long way. Many stores within their private brands have their own line of seasonings at more affordable prices as well. Something to look for would be “complete” seasonings that usually have a blend of spices and herbs. Trader Joe’s for example has their 21 Seasoning Salute, this blend is great for throwing into any dish without feeling like you’re missing out on flavor. It also saves money and time by limiting the need to purchase and prep a myriad of spices and herbs. A dash of any of these also won’t make your dishes automatically spicy, just simply more flavorful. (Spice does not mean spicy!) If you find yourself drawn to certain cuisines invest into those staples as well i.e. cumin, turmeric, soy sauce, sesame seed oil, jalapenos, cilantro, etc. Once those are there you can turn a rice dish into anything and add a different vegetable or base to set the taste tone. Experimenting with different tastes further and looking to loose recipes can be on a month to month basis where you step out a little further and grab fresh parsley, maybe even a small red bell pepper. No matter what though, you’ve got the tools to infuse more into each meal always in the cabinet and, more beneficial than that months old bottle of ketchup found at the bottom of almost every refrigerator. Especially if you begin to eat tofu, seitan, and alternative vegetarians meats–you want flavor!